You may recognise this top, I’ve blogged about it before here and here but in a different colour and I am tempted to buy more. The lace up detail trend is still going strong and has continued into 2016 and I couldn’t be happier. The detailing can instantly jazz up and add some elegance to a standard outfit so I’ve gone for double lace up. It’s a truly effortless style which can be added into any wardrobe and really change the look of a basic, casual outfit. 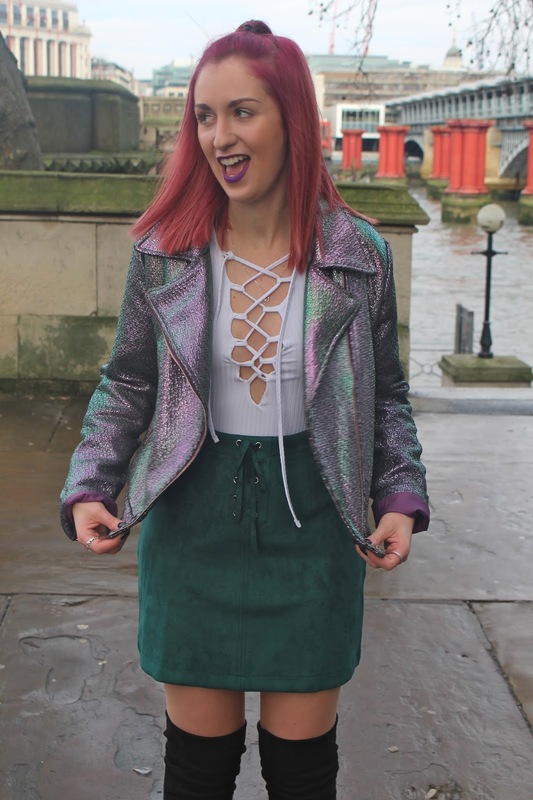 This is my excited face because I am amazed by this incredible holographic style jacket. I don’t think this jacket could scream ‘me’ anymore. Anything unusual and different and a bargain (this was £30) then it will be mine. There was a matching skirt but it’s sold out!! !